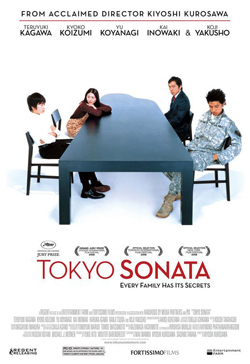 First of all, while Anne Allison’s book refers to the homeless and they have merely lost their home materially, Sasaki Ryuhei, who is a main character in the film Tokyo Sonata, has lost his home space mentally. That is, he has no place inside of his home. After WWⅡ, family roles in Japan have been rigid, such as “sengyo shufu” or the breadwinner of the family. Especially, the fixed view that a husband should work very hard for his family is an idea accepted by most Japanese. Ryuhei could not tell his family the fact that he was fired due to this fixed idea. He acts as if he is still working, wearing his suit and having card holder after his dismissal because being at home without any jobs of a husband is often recognized as ashamed things in Japan. Ryuhei’s former classmate who was fired like Ryuhei was even sets his cellphone ringing in designated time. They were afraid that people around them, especially their families, find out they have lost a job. Husband or father in Japan have to be just existence as people imagine. Ryuhei rejected a work as cleaning man and hoped a work people there wear suits at first, then it is also a kind of the fixed concept of people in Japan or himself. But such an idea is not only a cause of not telling the truth but also of a weak relationships. 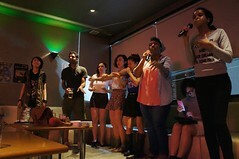 In Allison’s book, Japanese tend to seek their identity at workplace and have few connections with their family or neighbors. The characters in this movie also put their place on workplace, so Ryuhei would feel to take away “ibasho” when he lost his job, and he could not tell the truth his family because of disconnectedness and incommunicativeness. Allison says that this family is “ordinary” in Japan. In this movie I was most impressed by the scene that the family gather and start to eat a meal. This scene seems to be ordinary family’s life, but I felt something strange because although they are sitting in front of same table, they hardly talk each other. We generally think that they don’t need to gather for a meal if no one speaks, but I guess that sitting around the table with one’s family keeps a few relationships, and it may be only evidence that they are “family” even if nobody speaks. This strange sight can be seen in any Japanese home. Japanese are losing a spiritual home. This entry was posted in Precarious Japan: Instability and Youth in 21st Century Japan and tagged Anne Allison, family, gender roles, japan, japanese society, Precarious Japan, social change, social relationships, Tokyo Sonata, unemployment, work. Bookmark the permalink.